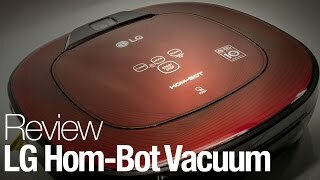 This LG HOM-BOT VR65502LV has a smart algorithm that along with a built-in camera or laser helps it build an efficient path for better navigation around the cleaning area. This function also prevents collisions with obstacles and cleans the house from 2 to 5 times faster than a robot without path planning. The robot is equipped with a small 2330 mAh battery that doesn’t last as long as an average robot vacuum, but it still can run longer even if the robot doesn’t have very strong suction power.